Hi, Good Morning. Thank you friends and viewers. 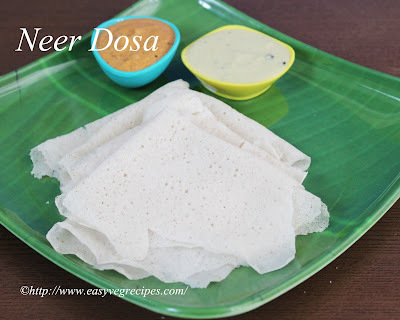 Today I will post how to make neer dosa recipe. 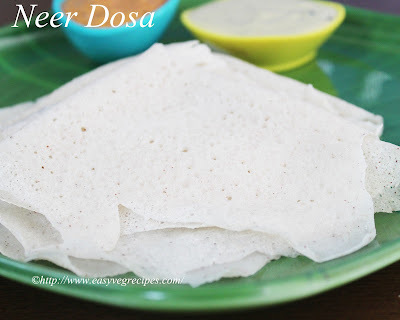 Neer dosa is a crepe prepared from rice batter and fresh coconut. It is very light and takes very less time to prepare. We need to soak rice for atleast four to five hours. Grind it to make thick and smooth batter. Add fresh coconut and salt. Crispy, flaky neer dosa is best accompanied with spicy chutneys. The word neer means water in Tulu language. This batter is also watery. We need to ue a tumbler to pour the batter on dosa tawa. We need not flip the dosa, once it cooked on one side just fold it in two sides and serve. These dosas have to be served immediately. My choice of tawa is always iron one to make dosa. The tawa should be thick and heavy. Though heating of the tawa may take long time, but the heat sustain for longer time. I did not tasted it anywhere, but heard about it a lot. So thought of give it a try, the result is awesome. One more recipe added to my breakfast regimen. I planned it for this Sunday morning breakfast. Soaked rice in Saturday night itself. Soak rice for 5 to 7 hours or overnight. Grind rice into a fine and smooth batter. Add very little water. Add chopped coconut and again grind it to a smooth batter. Add water to the batter to make it porous. Rest it for two to three minutes, water should form as top layer. The batter should be like that of rawa dosa. Heat iron tawa, sprinkle water to tast it. If the water sizzles, tawa is ready to make dosa. I used a tumbler to pour dosa batter, You can use it or if comfortable with ladle use ladle also. Pour a tumbler full of batter over the hot tawa. Cook till the edges of the dosa leaves the tawa. Slowly with the help of spatula, lift the dosa. Fold it to one half and again fold it into another half. this will make the dosa look like a flat cone.